When you don’t know what you’re talking about, sometimes it’s better to leave well enough alone. Especially if you’re the editor of a major news publication. Newsweek’s muddled correction of an erroneous correction about a non-existent historic Palestinian state is a case in point. Confused yet? You should be. However, Hill’s statement about a “historic Palestine” appears to be inaccurate as no Palestinian state has ever existed. Updated 11/30 12:14 a.m.: This story has been updated to remove information that includes an error that says no Palestinian state has ever existed. CAMERA subsequently contacted Newsweek to request a correction of the “correction,” noting that never before has there been a Palestinian state. CAMERA asked Newsweek to explain when, according to the editors’ belief, this state allegedly existed, and to identify its heads of state, its currency or its orders. Updated 12/3 3:50 a.m.: This story’s previous reference to “historic Palestine” has been deleted; the legal and historical status of a Palestinian state remains a subject of controversy and debate. 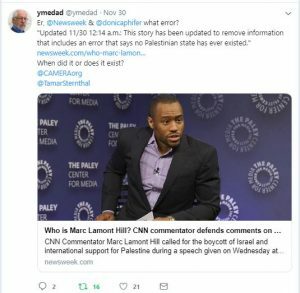 On the positive end, the “correction,” which perhaps may carry even more authority than the original text, on the assumption that editors thoroughly checked facts out before issuing a correction, no longer misinforms readers that there has once been a Palestinian state. On the other hand, what are readers to understand from the current unclear statement that “the legal and historical status of a Palestinian state remains a subject of controversy and debate”? There is no debate, scholarly or otherwise, regarding the fact that in the past there has never been a Palestinian state.